In these days of serious play, rhetoricians, game scholars, and compositionists alike have struggled with ways to legitimize the study of games as serious artifacts in our field. Enter Jan Rune Holmevik's (2012) Inter/vention: Free Play in the Age of Electracy , a text that effectively bridges the gap between theory and practice, work and play, to prove that games don't just have to be theorized or played; as scholars we can—and should—do both. As a lifelong gamer, history scholar, digital hacker, and rhetorical adventurer, Holmevik brings to Inter/vention a unique viewpoint on the topics of technology, innovation, and play. He positions himself as the perfect voice to promote the power of learning and creativity through play, and he does so by taking us on a historical tour of digital information through the lens of Gregory Ulmer's (2003) concept of electracy. In many ways, Inter/vention serves as a companion piece to Ulmer's work, making the concept of electracy accessible to the masses. Put simply, Holmevik explains that electracy replaces what some call digital literacy, positioning itself as the next major point of awakening in the writing revolution—third in line, following orality and literacy. Therefore, electracy isn't a continuation of traditional literacy but rather a new entity in and of itself and worthy of its own discussion. 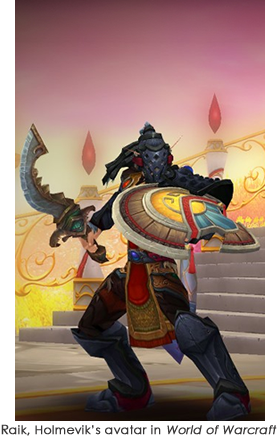 As a gamer myself—and as a former member of Holmevik's legendary academic World of Warcraft Venture Guild—I will attempt to be as objective as possible when I say that Inter/vention is one of the most valuable texts in gaming studies today. It sits on a special section of my bookshelf, alphabetically filed between Ian Bogost's (2007) Persuasive Games and Johan Huizinga's (1950) Homo Ludens: A Study of the Play Element in Culture . And it really does deserve that kind of company, bringing not only rhetorical expertise to the subject of games and play but also practical accountability. No other text I've found manages to so successfully cover the concept of scholarship and game studies from angles of both theory and practice. Each chapter of Inter/vention works through a different theoretical aspect—such as Ulmer's electracy or Jacques Derrida's (1967) free play—by filtering it through the lens of real examples from the world of computing. The book includes discussion on topics such as digital communities, open source software development, and cloud computing, with each topic always linking back to play. Holmevik explains ways in which play has shaped nearly every major computing event to form the digital age—the age of electracy—as we now know it. Inter/vention appeals not only to gamers, players, and historians but also to rhetoricians who want to increase their theoretical understanding of Gregory Ulmer's concept of electracy. Holmevik makes electracy accessible through historical accounts, real-world examples, and theoretical links to how programming and the Internet began, how they were in(ter)vented. A primary concept throughout Jan Rune Holmevik's (2012) text is electracy and its place in contemporary studies of both writing and rhetoric. In that sense, Inter/vention is not only a useful primer to understanding the importance of gaming and play, but it also serves as a manifesto-of-sorts for reinterpreting how to teach and study the digital humanities in general and digital literacy in particular. That is: if as rhetoricians we accept that language shapes reality, then the term digital literacies is no longer appropriate for describing the innovative forms of creativity that help define our technological world. We can't simply assume that historical quantifications of writing apply to today's digital forms. In fact, digital forms of expression, including games, should be just as valued as traditional written (i.e., pen to paper, keyboard to computer) forms of communication, and embracing electracy is just one way in which our field can begin to fully value such digital scholarship. In the second half of his book, Holmevik explores Stuart Moulthrop's (2005) concept of invention as a means of play. Here is where Holmevik's argument fully develops: that electracy isn't just about consuming digital media, or even about creating digital writing, but rather it is about making. Therefore, electracy is not just about writing; it's about action. Electrate scholars practice, do, make, act, enjoy. They play. A major component of Inter/vention is Jan Rune Holmevik's expertise in histories of computing. Starting at the beginning of the nineteenth century and working forward to today, Holmevik uses the chapters in his text to walk us through the major developments of digital computing. Overall, Holmevik successfully argues that none of the advances that have been made over the past 200 years would have occurred without a healthy dose of play. That is, play—or the ability to creatively experiment without boundaries—is what helps us invent, reinvent, and evolve. The historical evidence that Holmevik presents in Inter/vention legitimizes play as a scholarly subject that is worthy of exploration. What adds to the overall ethos of Holmevik's argument is the fact that the historical events he presents can hardly be refuted. His presentation is further bolstered by his own personal and professional expertise, a life that has been fully experienced through the balance of work and play. In Inter/vention , Jan Rune Holmevik demonstrates that he is more than a scholar, hacker, and player. He is an activist, challenging his readers not only to incorporate play into their lives but to go beyond merely thinking and writing and instead move toward doing. His call to action is just that: an intervention. Imagine this: We have all been under the influence of a dangerous substance. We have been led to believe that literacy should be valued above electracy, that work is more important than play, and that we must value truth and what is right above what brings us pleasure. Holmevik's intervention confronts us with this somewhat painful truth: that as rhetoricians, scholars, and writers we need to bring more play into our research, teaching, and personal lives. Ultimately he urges us to reject the traditional literacy-based norms of our profession to incorporate more play, to make, to do, to invent. When he's done, we want to join him on his playful journey, gleefully ripping away the boundaries between work and play. And with a newly-discovered grounding in history, theory, and practice, we also feel more equipped to make arguments to our colleagues, students, and administrators that not only is play a valid area of research but that it's essential to the advancement of our field. The reason this intervention works is that Holmevik can do what many scholars can't; he has the academic ethos to support his theoretical claims, as well as the street cred of a true gamer. Holmevik doesn't just study games; he lives them. And it is with this background that he navigates the worlds of both theory and practice, seriousness and play, to bring us a theoretical text that bridges the gaps between academia and gaming. What makes Inter/vention so valuable is that it brings awareness to the academic promise of gaming theory, as well as theoretical knowledge to an often cult-like gaming culture. In other words, it strikes a perfect balance between theory and accessibility for an emerging field that perhaps needs it the most. Bogost, Ian. (2007). Persuasive games: The expressive power of videogames. Cambridge, MA: MIT Press. Bogost, Ian. (2012). Afterword: The frog critic. 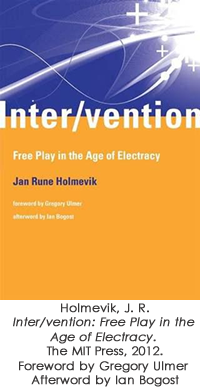 In Jan Rune Holmevik, Inter/vention: Free play in the age of electracy (pp. 161–64). Cambridge, MA: MIT Press. Derrida, Jacques. (1967). Structure, sign, and play in the discourse of the human sciences. In Jaques Derrida & Alan Bass (Trans. ), Writing and difference (pp. 278–94). London: Routledge. Holemvik, Jan Rune. (2012). Inter/vention: Free play in the age of electracy . Cambridge, MA: MIT Press. Huizinga, Johan. (1950). Homo ludens : A study of the play element in culture. Boston: Beacon Press. Moulthrop, Stuart. (2005). After the last generation: Rethinking scholarship in the days of serious play. In proceedings from Digital Arts and Culture Conference '05: Digital Experience: Design, Aesthetics, Practice (pp. 208–15). Copenhagen: IT-University. Ulmer, Gregory L. (2003). Internet invention: From literacy to electracy. New York: Longman. Ulmer, Gregory L. (2012). Foreword: Becoming electrate. In Jan Rune Holmevik, Inter/vention: Free play in the age of electracy (pp. ix–xvi). Cambridge, MA: MIT Press. © 2013 Carly Finseth, Texas Tech University.